Binding link used by Meg on Sam. Binding links are symbols that can keep a demons, or any other possessing entity trapped inside its meatsuit i.e. the human it is possessing, and in the case of demons they can neither escape voluntarily or be exorcised. Binding sigils can be etched on to various types of restraints, where they work in the same way as having been carved into the flesh. 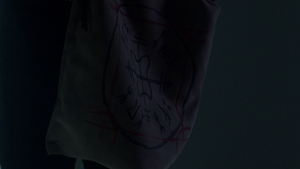 Certain binding sigils, like the ones etched on the handcuffs Sam and Dean discovered in the Men of Letters Bunker, also appear to weaken the powers of the prisoners they place into them. Known colloquially as "angel cuffs" by the Winchesters, in addition to binding and weakening demons, the handcuffs also work on reapers and angels, but are not strong enough to hold an archangel. Binding links may also be related to the "binding magic" used on curse boxes to keep the evil inside. When Meg possesses Sam she brands a binding link into his forearm. When Bobby tries to exorcise her, it doesn't work. Bobby realizes the brand is keeping the demon trapped inside Sam, and burns across the mark with a hot poker, breaking the spell. Crowley carving a binding link into Brady's chest. When Ruby attempts to make a deal with Alastair to let the Winchesters live in exchange for Anna Milton, Alastair instead captures her and while torturing her has restrained with leather straps with binding magic etched into them. Crowley carves a symbol into Brady's chest while they try and convince him to help them. Crowley: This bit of carving will tie our friend here down. No zapping off, locked in the meatsuit. An important part of our bargaining strategy. Meg strapped down with binding magic. Meg tries to leave her host, but Crowley has worked some form of binding magic to prevent demons inside his monster prison from leaving their bodies. Later when Meg is captured by Christian Campbell, she is placed on a torture table, restrained with leather straps that have binding magic etched into them. While going through old Men of Letters records, trying to figure out a way to cure a demon for the third trial. Sam finds a film reel, which showed a demon chained up in shackles with various binding sigils etched into them, go through a failed exorcism in an attempt to cure the demon. Crowley is shown in the Bunker's dungeon to still be bound using the binding linked handcuffs, as well as other restraints with spell work etched into them. Crowley is once again shown to be locked up the Bunker's dungeon when he meets the Wicked Witch of the West, who is unable to free him from his restraints, as the dungeon is warded against all supernatural beings. Crowley is still locked-up in the dungeon, bound with chains and the handcuffs. Crowley is freed from the Men of Letters dungeon, to help expel Gadreel from Sam's body, but only on the condition he needs to wear the binding handcuffs. Later when he talks to Cecily, he shows her the cuffs and asks if they can be removed, to which she replies "Not without the key." Later, Crowley also wears a collar that apparently serves the same purpose as he can't leave his meatsuit with it on. Gabriel is ambushed by Fenrir, Narfi and Sleipnir, who place a bag with a binding sigil drawn over his head and drag him off to be sold to Asmodeus. After being captured by Kipling and his demons, Castiel is restrained in the bar with special chains binding his powers. This page was last edited on 20 April 2019, at 19:55.